My company is launching a BitTorrent Sync cloud storage solution! It will be targeted to large volume of data. I am looking for 100 Beta Users ! I am offering 250gb for 1 month. Just signed up, first comment is that the validation link is missing in the email, the http:// in the address and therefore at least my email client isn't making it clickable. Might be a hurdle for others. During the shopping cart/plan selection phase I am getting an error with the code and it doesn't work. The red wide bar that I assume would contain the error text is blank. During the shopping cart/plan selection phase I am getting an error with the code and it doesn't work. The red wide bar that I assume would contain the error test is blank. Your order was not successfull because you need to redeem the coupon by clicking on the box next to the coupon entry box. I have tried that a few times with that same effect, I would take a screenshot but it would look as though I haven't entered anything in the box. I can do a team viewer video. I know the email and pass is right. So not sure whats happening. Chrome worked fine with logging in. 2nd problem is the same as Dimtar after trying to redeem voucher. 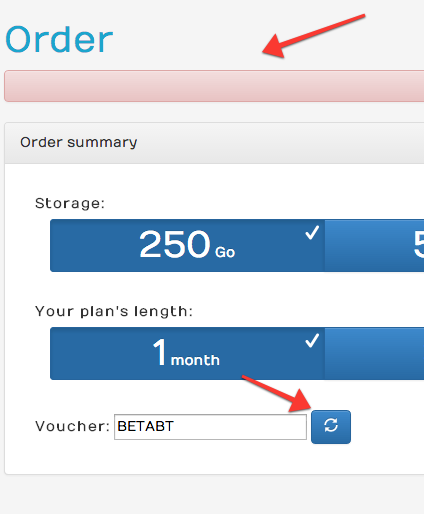 thx a lot for the feedback, I was able to reproduce the issue when you enter a coupon first without any plan selected. you can reset it by refreshing the page. Are you planning on supporting encrypted shares? It need to be more tested before on the client side and be accessible without an API key for lambda user. Thank you for your feedback, indeed it's a bit restrictive to stay on the safe side. If it's not copyrighted I have nothing against using the service for educational purpose! It's a good use case, don't hesitate to give a feedback on the performance of the service. I don't see the point of restricting users to only share with a specific amount of people. You could always limit the bandwith on each share if it becomes a problem. And won't sharing something with 100 users not use too much more bandwith (assuming it is not only leeches)? The ability to only share the encrypted read-only secret is also vital. Sharing my read-only or read-write secret with you would make the service far worse than Dropbox. At least they are a known corporation, with liquidity, if they violate my privacy I could take legal action, taking legal action against a company that has potentially no assets and tons of liabilities seems silly. Well, I started uploading material for the next semester. Lessons begin middle februar, so we have time to prepare all, not only the infrastructure. Such a service is for me very interesting given the small bandwidth I have to upload things. BTW, two secrets (or more) per account will be interesting. Rarely will one secrect, at least for educational purposes, reach 20 GB, so each secret will have 230 GB free. Problem is i such cases more badwidth than storage space, but probably only in such few cases. Are you paying for several of them? If you are paying for two of them, then it would cost minimally more to just rent an entire server, and deploy it there. Especially if you only need 40GB of storage. I am a bit curious where you are. Bandwith seems to be incredibly cheap, for €12 eur a month I would be able to have 100/100mbps, which should be more than enough to share a file to less than 100 people. I am sure even my 10/10 mbps connection could share a file to 100 people if they seeded a little themselves. The use case is also interessting. Are you trying to share these files to laptops, tablets/phones or desktops that can't be moved? If you want to share it with laptops, it would probably be far better to setup a NAS on your local network, they would then bring the laptops home and seed it (and then they'd provide the bandwith for all the other people). This is the biggest advantadge of the bittorrent protokoll, you don't need the bandwith to reach everyone, you only need the bandwith to reach one or two people. I guess there is a difference if you are in a country with slow internet connections, or in one where people have great speeds. If everyone has good broadband with good uploads then distributing it won't be a problem, if everyone has low download speed and even worse upload speed then it seems like a rather difficult project. If the files you are sharing is not restriced or licensing prevents you from sharing it, then I am sure you could find someone that would be willing to host tiny shares for free (I wouldn't mind hosting a couple 20GB shares on my fileserver), if the files are restricted then sharing it through Bitsync seems like a terrible idea, one student could make the key public, and then the files will be avileble for everyone. Multiple secret per plan is planned. For encrypted as I said we must wait a public release allowing it, I can generate them because I have an API key but If I generate it for you it useless from a privacy perspective. Well, I'm on a very small town (29 habitants) in the mountains. The only internet link is via long distance radio (Wimax), so I'm paying 50€ for 1 mbps, more is not available. I have to share the bandwidth with weather data, email, http and other services... there is no video nor audio streaming possible, and here I have to push also BTSync, it's impossible to make this without an external server. The problem is that most students have a poor or not at all internet connection at home. Only if they access the campus they can connect to eduroam or similar services with laptops or tablets, and they should be able to download to acceptable speed since ther are only few hours a day online. The material I have is not critical, it is mostly not copyrighted, but there are some performances and works made by the students themselves, so probably they are the first interested on some privacy for they school works. Anyway, if the secret is breached, the damage is not very high. If there is something really private, it is uploaded with encryption and strong passwords, and also privacy warnings. In some countries "rural internet" is only an empty word used by politics! Not to hijack this thread, but I am approaching the same problem in a different way. I think most people will use a third party service only for the early days of a peer-to-peer exchange. Think a wedding. Once everyone exchanges photos there is no longer the need to have an always online peer. So in our case we are focusing on providing temporal space. Also, it seems that at the end of the day BitSync will use a profit sharing model if you are a for profit, so keep that in mind in your pricing. After a lot of work http://www.btsync.com now allows you to enter your own secrets! you can now use encrypted secrets! Pricing will be revised soon! HTTPS is now available to transmit your encrypted secret ! The website doesn't work, at least not in China. You should add a few mirrors. The Beta is now finished, the new version has been deployed. We are now offering ulimited storage from as low as 8€/month !